Former Governor Terry Branstad says he’s “learned a valuable lesson” in the opening weeks of his campaign for a fifth term in office. On Saturday, November 7, Branstad made his debut on stage with the five other candidates who’re seeking the Republican Party’s 2010 gubernatorial nomination. It did not go well. “I know there are some that say, ‘Well, you’ve been out of politics a few years. You may have lost a few, uh, you may have lost a few, uh, uh, of your steps,'” Branstad said at the start of that speech. During a wide-ranging, 40-minute-long interview with Radio Iowa on Wednesday afternoon, Branstad acknowledged that speech fell a bit flat. 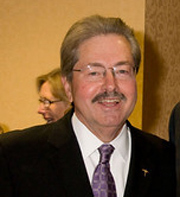 Branstad served as president of Des Moines University for just over six years. He was Iowa’s governor for 16 years — during the Farm Crisis of the 1980s and the boom years of the 1990s. Branstad isn’t talking specifics yet or endorsing controversial ideas like consolidating counties or schools. Branstad considers Iowans, in general, to be resistant to change. But Branstad argues the size of city, county and state governments needs to shrink. Last weekend one of Branstad’s rivals said road builders were telling him Branstad had promised to approve an increase in the gas tax if he’s elected. During his interview with Radio Iowa, Branstad said that’s not true. The current state tax on a gallon of regular unleaded gasoline is 21 cents per gallon. Gas with a 10 percent ethanol blend has a 19-cents-per gallon state tax. I989 was the last time the gas tax was raised in Iowa. Branstad was governor then and he approved changes in the formula which distributes gas tax money to state, city and county roads along with that increase in the gas tax. In October, Branstad retired from his job as president of Des Moines University in order to seek a fifth term as governor.